ETN: SNG broadcast services in Pakistan. the first of its kind in the country. 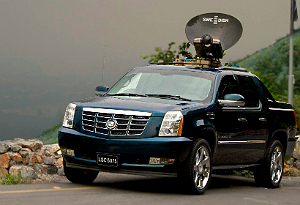 Powered by a CCT 90 Swe-dish auto point system, fitted with a 50w SSPA, it has a set-up and uplink time of under three minutes. The vehicle supports a full HD dual-path system with audio/video monitoring.